No matter the activity or the body part we’re analyzing, a proper warm-up is essential! We need to prep our tissues for the work ahead of them. A common question I hear from volleyball players of all ages and skill levels is: “How can I reduce the chances of a knee injury?” The media may shine a light on season-ending ACL injuries, but you should know this: if you don’t take preventative measures, there are many other injuries that can occur in your knees both acutely and over time. My advice is that you show your knees some love and do one proactive measure in each of the following categories. No matter our age, we all need to work on overall strength. If possible, I suggest you seek out a professional to learn some simple exercises that will keep your quadriceps and hamstrings strong, durable and capable of handling the demands of volleyball. As a clinician, I often see strength imbalances in these areas of the leg that can lead to knee injuries. Recommended exercises: walking lunges, squats, hamstring curls and bridges. Simple enough advice here – stretch! Many USA volleyball athletes tell me they wish they’d learned to appreciate the benefits of stretching during their younger playing days. 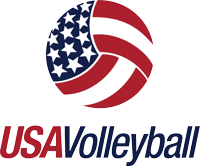 Volleyball is a multi-joint, dynamic sport, so I would encourage you to value both the flexibility of your muscles and tendons and the mobility of your joints. Remember, one part of your body impacts another. For instance, if your ankle joint isn’t in an optimal range, the forces will lead up the kinetic chain to the knee. And if the hamstring, quads and iliotibial band aren’t optimal, it may lead to poor patellar tracking and knee pain. Recommended exercise: Bretzel stretch, downward dog, kneeling hip flexor stretch and world’s greatest stretch. Recommended warmup: combination of dynamic stretches and activation strength and plyometric exercises. These two items are often overlooked, but they are definitely contributors to our knee health. Like I mentioned before, the stability and mobility of our ankle is key to absorbing forces. If you’re not wearing appropriate footwear, those forces won’t be accepted and dissipated like they should be. This leads to additional knee stress. Comfort is often a determining factor for volleyball shoes, but I would advise you to get a shoe that is stiff enough to be supportive during side-to-side cutting as well as allowing your heel to sit deeper in the shoe. That will add stability during plyometric moves. Knee pads will always be debated in the volleyball world, but personally, if I’m planning to toss myself to the floor to dig a ball, I want a little cushioning. Bruises don’t necessarily make us tougher. Stability and mobility of joints go hand in hand. It’s important to have good balance throughout all of your joints. Visualize a single-leg landing from a block. First, your foot and ankle need to hit the floor in a proper dorsiflexed position to stabilize the load and allow your knee and hips to follow in that flexion/absorption path. If you land awkwardly on your foot, it causes unnecessary stress for your knee and throughout the kinetic chain to your hips and spine. For me personally, this is the BIGGEST factor. Volleyball players often can get away with non-ideal technique without having pain or getting injured. However, poor technique builds patterns of movement that may set you up down the road for failure and/or injuries. If you’re a coach, be sure to emphasize the importance of doing things right. If you’re a player, make it a priority. Good technique not only reduces injury risk, it makes you a better volleyball player.